Jim Collins - Concepts - First Who…Then What? First Who, Then What—get the right people on the bus—is a concept developed in the book Good to Great. Those who build great organizations make sure they have the right people on the bus and the right people in the key seats before they figure out where to drive the bus. They always think first about who and then about what. When facing chaos and uncertainty, and you cannot possibly predict what's coming around the corner, your best "strategy" is to have a busload of people who can adapt to and perform brilliantly no matter what comes next. Great vision without great people is irrelevant. The good-to-great leaders understood three simple truths. First, if you begin with “who,” rather than “what,” you can more easily adapt to a changing world. 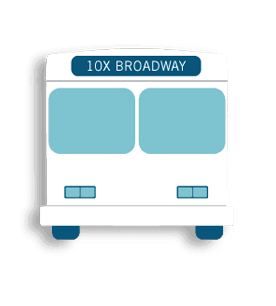 If people join the bus primarily because of where it is going, what happens if you get ten miles down the road and you need to change direction? You’ve got a problem. But if people are on the bus because of who else is on the bus, then it’s much easier to change direction: “Hey, I got on this bus because of who else is on it; if we need to change direction to be more successful, fine with me.” Second, if you have the right people on the bus, the problem of how to motivate and manage people largely goes away. The right people don’t need to be tightly managed or fired up; they will be self-motivated by the inner drive to produce the best results and to be part of creating something great. Third, if you have the wrong people, it doesn’t matter whether you discover the right direction; you still won’t have a great company. We expected to find that changes in incentive systems, especially executive incentives, would be highly correlated with making the leap from good to great. With all the attention paid to executive compensation—the shift to stock options and the huge packages that have become commonplace—surely, we thought, the amount and structure of compensation must play a key role in going from good to great. How else do you get people to do the right things that create great results?We were dead wrong in our expectations. Why might that be? It is simply a manifestation of the “first who” principle: It’s not how you compensate your executives, it’s which executives you have to compensate in the first place. If you have the right executives on the bus, they will do everything within their power to build a great company, not because of what they will “get” for it, but because they simply cannot imagine settling for anything less. Their moral code requires building excellence for its own sake, and you’re no more likely to change that with a compensation package than you’re likely to affect whether they breathe. The good-to-great companies understood a simple truth: The right people will do the right things and deliver the best results they’re capable of, regardless of the incentive system. Yes, compensation and incentives are important, but for very different reasons in good-to-great companies. The purpose of a compensation system should not be to get the right behaviors from the wrong people, but to get the right people on the bus in the first place, and to keep them there.